Andy Ricker brings Pok Pok Phat Thai to Chinatown, but the bland street food dishes don't live up to the original Portland phenomenon. Andy Ricker's original Pok Pok opened in Portland in 2005 and, it seemed, Southeast Asian street food in America would never be the same. 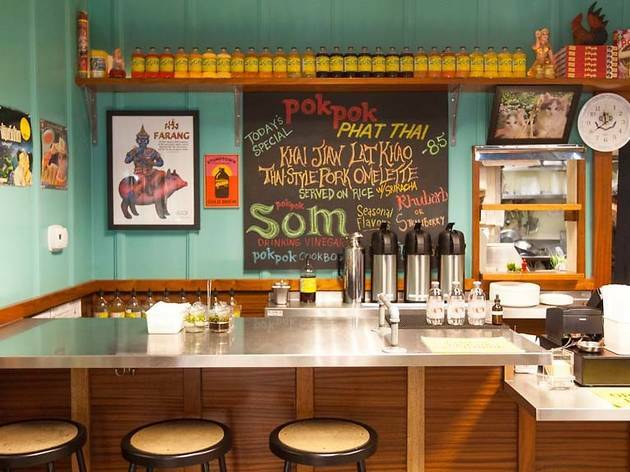 The popularity of Pok Pok spawned Pok Pok Noi and Pok Pok Wing, then a Pok Pok and Pok Pok Pat Thai in NYC before, finally, Pok Pok Phat Thai opened in LA's Far East Plaza in Chinatown. Despite its storied background, the restaurant fits right in with the other businesses in the plaza: casual and small, with food prepared on paper plates before your name is called out over a loudspeaker. 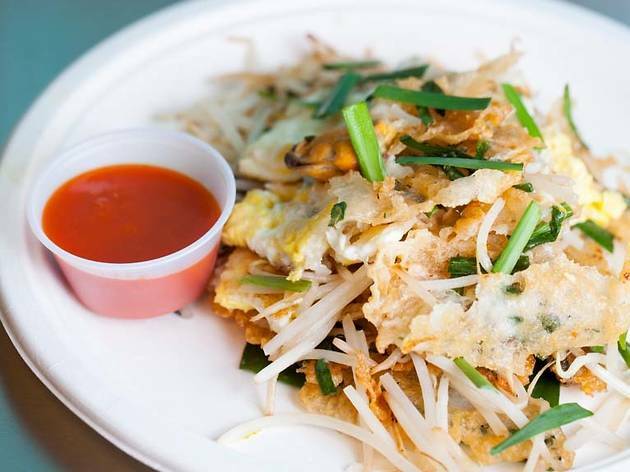 There is a heavy DIY element to Pok Pok Phat Thai's dishes—that is, diners are encouraged to season their food to their liking with a number of condiments available. I have no problem with this approach, but when a restaurant asks its customers to, essentially, finish preparing a dish, it needs to offer a great foundation to begin with. 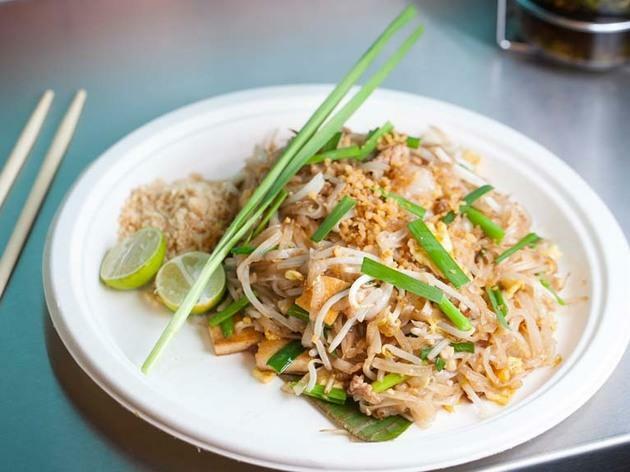 Instead, the phat thai ruam, a signature phat thai dish with prawns and ground pork, is bland and one-dimensional, and its prawns uncomfortably chewy. The hoi thawt, a crepe that promises to be stuffed with fresh mussels, eggs, garlic chives and bean sprouts, left me playing a game of hide-and-seek with those mussels—the pancake was dominated by bean sprouts and little else. Do the condiments help? 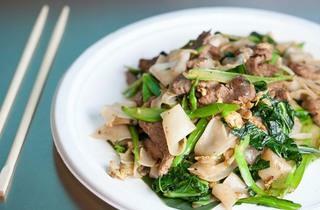 Fish sauce, sugar, chile powder and vinegar are all within reach, but there's only so much any of them can do to liven up the dull phat thai or the phat sii ew, whose gummy noodles and limp Chinese broccoli left little to rave about. 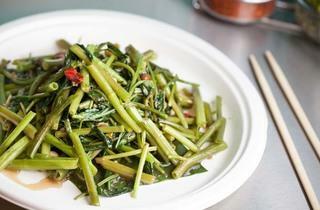 This is not to say that all of Pok Pok's dishes are a miss. 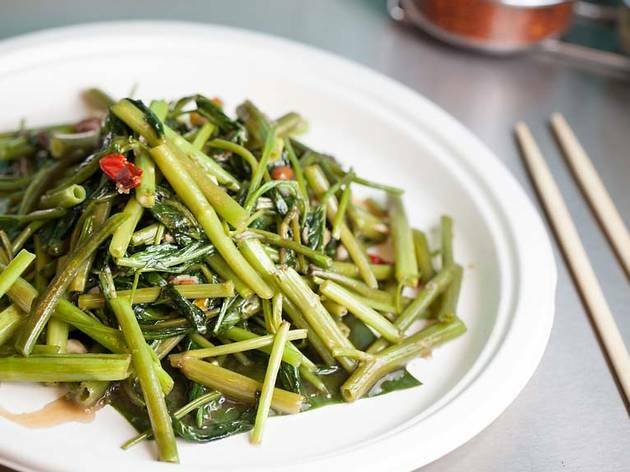 The phak buung fai daeng (a good stir fried water spinach dish) doesn't need any doctoring, and I'd stop by for a bag of their house-roasted red peanuts any day, with its dried lime leaves adding an unexpected jolt of citrus. But a bag of peanuts shouldn't be the best thing on the menu, and the diner shouldn't be responsible for taking a dish from just OK to great. 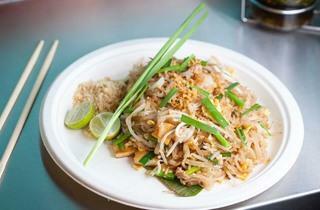 When Pok Pok Phat Thai finally made it to LA, I was looking forward to some of Ricker's Portland magic. Where is it? What to Eat: The house-roasted red peanuts ($4). The phak buung fai daeng ($9.50). 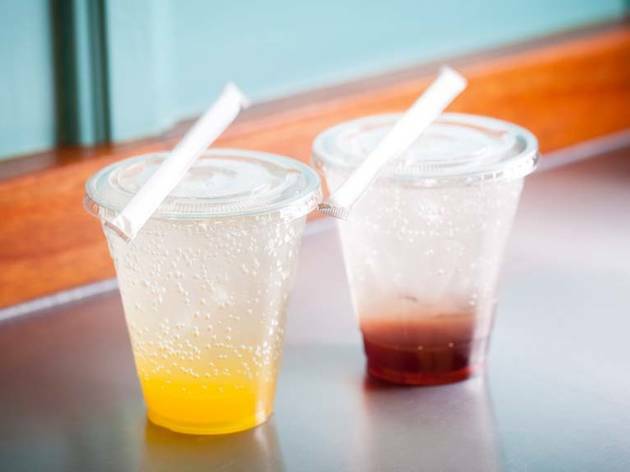 What to Drink: Behind the cash register, bottles of Pok Pok's Som drinking vinegars line a shelf, tart concentrates that are added to soda water for $4 (whole bottles are available for $16 if you want to make your own concoctions at home). 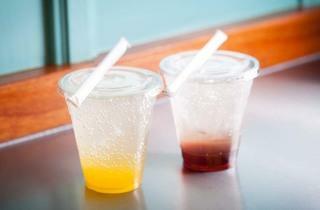 They're delicious, even better than the Thai iced tea, and the only problem you'll have is picking a flavor—classic options like pineapple, mint, honey and ginger are available, but so are seasonal ones like turmeric and celery. 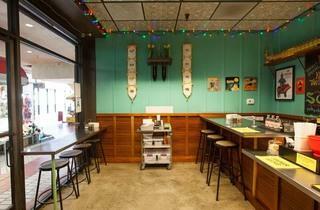 Where to Sit: Minimal counter seating is available inside Pok Pok, but you'd be better off grabbing a seat at the benches outside. Brightly laminated tablecloths cover a stretch of communal benches—a perfect backdrop for all those Instagram photos you're going to be taking. 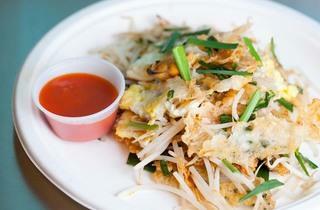 The LA Pok Pok is a bit of a conundrum. It has a lot to live up to, with its original location in Portland drawing national attention and leading to outposts in New York and now, LA. I happen to really like the small Chinatown location (and who doesn’t love a brightly-colored, communal seating picnic table?). But the food is just so-so. It’s not bad! It’s just not great, and in a city with so much amazing Thai food, hip décor and reasonable prices just aren’t enough to warrant a winner. That drinking vinegar, though? I’d go back again and again just for that. What a bunch of picky nonsense. 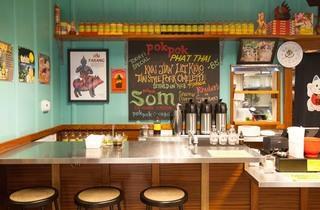 I ate at this Pok Pok location just last weekend and it was great! 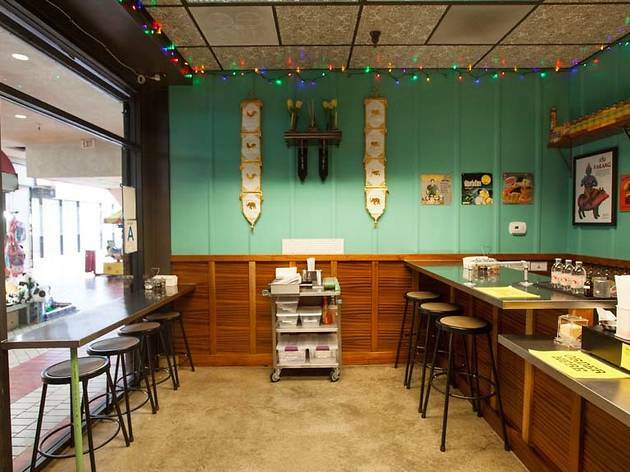 Does it match the ambiance of the Portland location, no possible way since you're NOT seated next to all of the characters from Portlandia but in real life. This location happens to be more of a pop-up location while the permanent shop is being built 3 blocks North. So is it a great location? Not really. Is the outdoor picnic table seating truly fabulous? No. Is the food fresh and fantastic? Absolutely! 2 stars is a pretty lowball review for this shop since it's basically street food done well at reasonable prices. I'd give it 4 stars considering the price/quality ratio.